Today my Mobius 57 finally arrived in the UK. 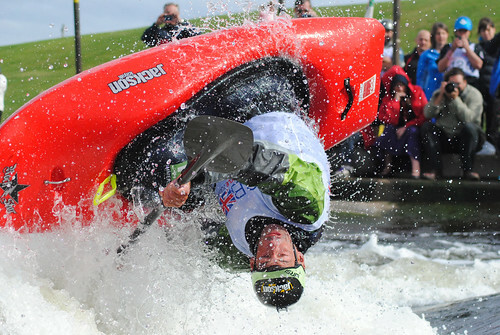 We have had lots of rain over the last week and a half meaning that our main White water course Holme Pierrepont Nottingham has been closed due to flooding. For the last week I have been planning the arrival of my Mobius and praying that levels stay friendly. Levels were good and Newark weir has been running for a few days, Newark weir is a series of waves formed over a weir producing a very shallow wave approx. 2in deep with a very flat trough. Newark is a great place to spin, soul surf and shallow blunts are accessible. I was very happy as managed to get a few emotional last sessions with my Project X56 before the arrival of my Mobius 57. Here’s a quick shot of a 56X on Newark taken a few days ago. Yesterday we had a sunny day (well sunny for the UK in October) and water levels dropped rapidly meaning Newark was starting to get to a flushy level and Holme Pierrepont white water course was still flooded. Nightmare! So this morning I thought today was going to be a disaster and I was going to have to stick to a flat water session with my new Mobius. Thankfully a phone call from fellow team paddler James weight informing me that the wave was just working meant it was worth the journey. I arrived to find a number of paddlers enjoying the wave, not the best levels but a chance to get the Mobius on a wave and start to get a feel for how it handles. I was impressed, it took minutes to feel comfortable in the boat and the transition from my X56 was easy just what I was hoping for. So how did I find the boat on the wave? the Mobius handled well, I found it very fast and easy to retain even when almost dropping off the wave the hull speed made it easy to move back down the trough. The edges super easy to initiate and very responsive to different amounts of edge just like the X56. The hull speed was also good in a backsurf and grinding the face of the wave even on a flushy level. I found the Mobius 57 very light compared to the X56 making it easier to manoeuvre on the wave and on the flat. 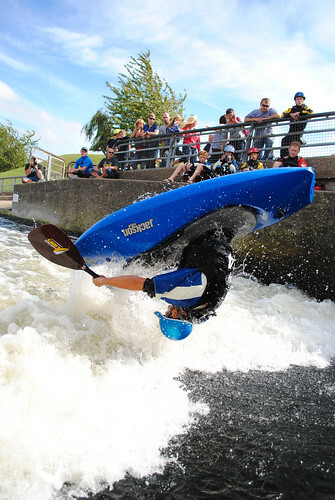 Flat water cartwheels as has already been said are effortless and well balanced making this a great boat for those wanting to enjoy a bit of freestyle where you don’t have a local feature or white water course/park. 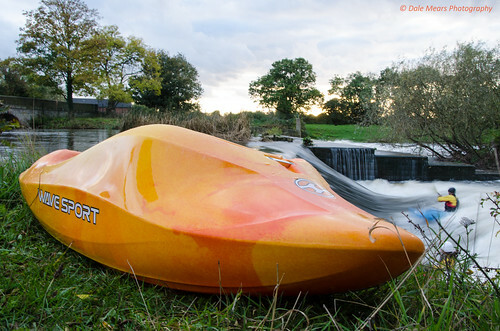 I was lucky enough to try the prototype Mobius during the summer so have had a go in a hole and found the boat very responsive but as levels have dropped aim to visit Holme Pierrepont White water course tomorrow to see how the boat preforms in hole. Paul Sheppard has been working hard on improving the features at Nottingham and the likes of James Pringle Bebbington (Pringle) and Claire O’Hara have been helping test the new features. I can’t wait for tomorrows paddle now! Even thought we are forecast 80 mph winds here in the UK! Here are a few photos from today of the Mobius, I will put some more and an other update tomorrow. When it comes to camera straps I have always stuck to my manufacturer supplied strap from Nikon. I was always happy with them thinking that it did its job was fairly comfortable and was strong and reliable. For the last month now I broke the mould and have been using the Joby Ultrafit Sling Strap instead of my standard Nikon strap. I always have my DSLR on me and mostly can be found photographing around water as a keen white water photographer. A month in and I can safely say what was I doing for the last 4 years. The Joby Ultrafit Sling strap is a great piece of kit. I will start with the advantages of making the switch from your standard strap. The Ultrafit sling offers Joby’s SpeedCinch system which allows you to quickly grab your camera and pull it from your side with ease and it really works. It is quick and effective. Due to wearing the sling across your chest it wants to naturally swing into position as you grab it. In reverse the strap is also really easy to pull up close to your body so it is not swinging low by your side. I found pulling into my body when around water very reassuring indeed and you can lock the strap off easily in a split second. The Ultrafit sling is very comfortable which makes long shoots a lot less of a suffer too. The strap has been really good on quick shoots and on travel abroad, even when wearing over a camera bag was perfectly fine. The strap allows your camera to sit on your side using its natural weight meaning that your lens will face downwards settling and not putting any strain on your lens mount. I have used this strap with up to a 300mm lens and it is really well balanced and does not feel heavy like the manufacturers straps. Build quality is good and the strap looks stylish too. I also like the fact that aesthetically this strap doesn’t stand out like the Nikon yellow and Canon red on the straps so attracts less attention in busy cities. The strap attaches on the bottom on your tripod mounting hole and if worried that you often shoot on a tripod don’t worry you can buy a plate to allow you to use both without having to unscrew the strap. The attachment has a screw with a small tightening plate to secure your camera quickly. I have also used a coin to double check and ensure the strap is secure and it has been solid as a rock. In terms of usability the strap allows you better control of your camera as the strap mounts on the tripod mounting hole allowing easy access to the top of the camera. I tried to find some negatives and as yet I am struggling I think the only negative is that I can’t sit my DSLR flat on a table due to the positioning of the mount but the positives overwhelm this so it does not bother me in the slightest. For about £30 from most retailers this is a real bargain if you’re an active photographer or enjoy shooting in the busy hustle of the city. Check it out at http://joby.com/camera-straps/ultrafit-sling-strap-for-men/ for videos and further information. If you can share even better! First impressions of the Watershed Ocoee are excellent, packaged very well in quality packaging a pride which watershed clearly have in all aspects of their business. The Ocoee is the smallest duffell Watershed manufacture and this has made it an excellent choice for the river boater/ freestyle paddler. Small enough to fit in the back of your kayak or on your lap if transporting in a playboat. The bag itself is made of Kryptothane® Fabric, a 420-denier nylon coated in layers of polyurethane. I have owned the larger Chatooga bag now for a couple of years and it is still in great condition. This material will take knocks scratches and scrapes. Think of it as a really tough dry bag. I want to comment on why choose Watershed over rivals like Peli or Otterbox. I was a big fan of Peli and growing up always kept my cameras in them. As a waterproof box they are great but I started having worries regarding their stiffness. Where the hull on my kayak can flex and believe me I would rather it flex than take the impact sometimes, the Peli case does not. My concern was that a peli case could break open or worse cause damage to my kayak by not flexing. The watershed duffels are flexible and if secured correctly provide a suitable air pocket that will flex where needed if the hull is flexed. Now I am happy that my camera is protected in a Watershed bag. I can see the argument that surely this could knock the camera and damage it but the bag receives plenty of padding from the liners (sold separately). Myself personally I have the dividers also to separate my bag into sections, I carry a 18-105, 70-300 and a 50mm prime on most trips along with spare batteries and other necessities. The dividers come in a range of sizes and the most useful of the set is a small padded block with a cut out to rest the camera with lens attached taking the strain off the cameras lens mount. If you choose Peli you have to buy a massive box to store a camera and lense or sacrifice buying a smaller box and having to remove the lense and carry the body of your DSLR separate way too time consuming for on the river. Secondly style; Watershed bags are damn good looking! The material looks good; the colours are vibrant and stand out. The bags look good on the water or off the water watershed provide a good range of colours I prefer the red and blue although have noticed the yellow seems to be popular in the UK. It’s nice to wonder around and not look like you’re carrying your lunch box! 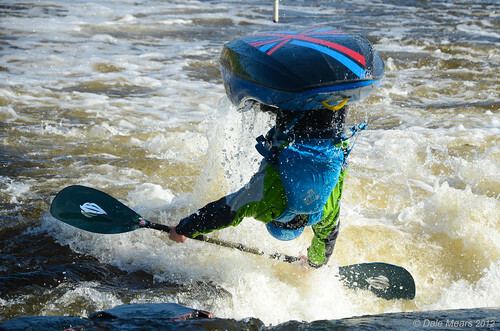 What to do when it snows in the UK, hit the slopes in your kayaks. Myself and a couple of friends armed with a Project X, Allstar and waveski went to Woolaton Hall to dodge small children and adults in our rather sturdy crafts. A couple of photos below. It was no suprise the Waveski was the fastest with the Project X in second! Just remember be careful and wrap up warm! 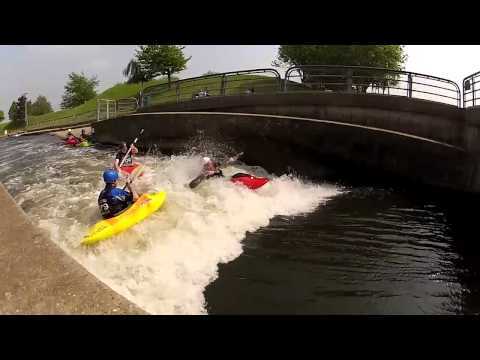 Check this video out from NTU canoe club they have entered it for funding give it a like! 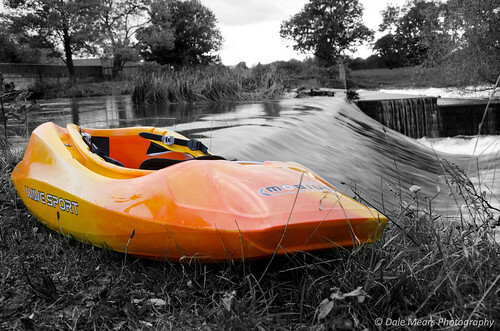 Put a bit of colour in your paddling! Why am I writing this blog post? Simple! Greys and blacks are history; we are in a modern age where the cool kids are wearing bright sometimes hideous colours. But what do these colours mean to you? This year more than ever paddling companies have released their kit in a whole new range of colours, some say this allows individuality, some say it is so more paddlers can colour code their kit and some simply hate it, but what how can the colour of your paddling kit effect you? Outside of kayaking colour is used for many different purposes; symbolism and happiness are two of these seen around our world. In India colour is seen as a great importance to those with little or no money, they still dress in colourful outfits as believe it to be motivational and strongly believe it will bring happiness. Colour can be used to attract people to products and take on different meanings for example ‘Green’ means go, or good, safe; red on the other hand means stop, danger a colour of warning. Colour is down to personal preference and will always mean different things to different people so what I am going to do is look at how your kit shows up from a photographers point of view. 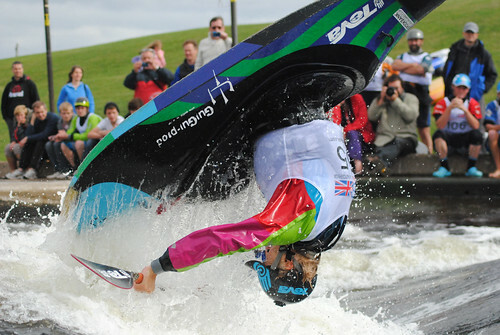 Whether you’re buying a new kayak or cag, Helmet or BA colour should be considered. What do you want it for? 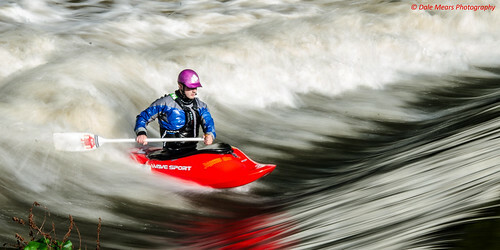 For example a bright colour will show up on a river hence ‘safety Yellow’ where as a black or white helmet can often blend into the background or white water. Likewise with boats the darker the kayak the less it will stand out on the water. When I have selected boats I have always looked at what shows up best on photos, I want to see photo’s of myself from events and paddling sessions, being noticed may be important to you if you are an up and coming paddler and want to be seen, obviously colour does not compromise natural talent and if you are good you will be seen anyway, but companies will want to see you doing your thing on the river or local play spot and good photos sell. There has been a big surge in the sales of DSLR camera’s because paddlers want to capture their adventures and show their friends and the online community. Modern sensors are capable of capturing high speed action in all sorts of lighting conditions, the UK generally has dull weather, on an overcast day your DSLR’s auto focus will struggle with dull colours, you may have to increase the ISO so you can raise the shutter speed to catch that all important shot you are looking for. DSLR camera’s and all cameras for that matter struggle with light and dark and have to meter a scene if the sky is bright and foreground dark your camera will be trying to work out which is normal and how to balance out the photo, which part of the photo should it meter as correct. For example if your camera tried to meter its exposure for a mountain landscape it will often meter for the land overexposing the sky and wash out the detail on a snowy day it may do the opposite and expose for the snow making the sky very dark and under exposed. 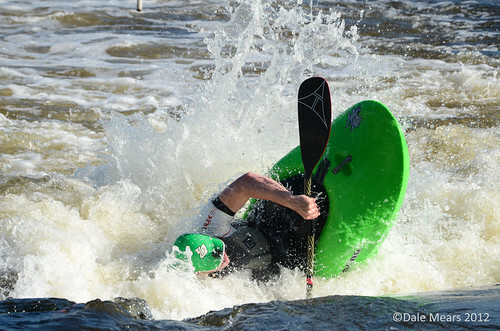 It all boils down to what you want for your paddling photography. Do you want your camera to expose for the paddler and kayak not the water around them. If you wear dull colours your camera will most likely expose for the water which is white (ish) if it does this it will underexpose and darken your shots making you dark and often out of focus. My advice therefore is to aim for bright colours such as yellow, bright green, red, brighter blue’s and orange. I also personally stick to single solid colours so there is more area for the autofocus to lock on to. Avoid light and dark colours especially white and pale colours, black and greys, I recommend the same when selecting your kit, if you want to be seen and want to be the star of some clear photos brighten yourself up this winter! Give those camera’s a chance.